The end of the year banquet has been scheduled for Monday May 6, 2019 at the Receptions Banquet Hall on Loveland Madeira Road at 7 pm. The cost is $14.00 for show choir members and $18.00 for family members. We hope you all can attend it is a great way for everyone to get together and share memories from the year and for the students to have a chance to be all together in one place again. With the number of students this year, it will be first come as there is a capacity limit. Due to the problem of many last minute add-ons which causes problems for the venue we have an absolute deadline of April 24th to turn in your registration. After that we will no longer be able to accept reservations. Forms along with payment can be turned in to Mr. Miller or Donna Bernstein by April 24th. 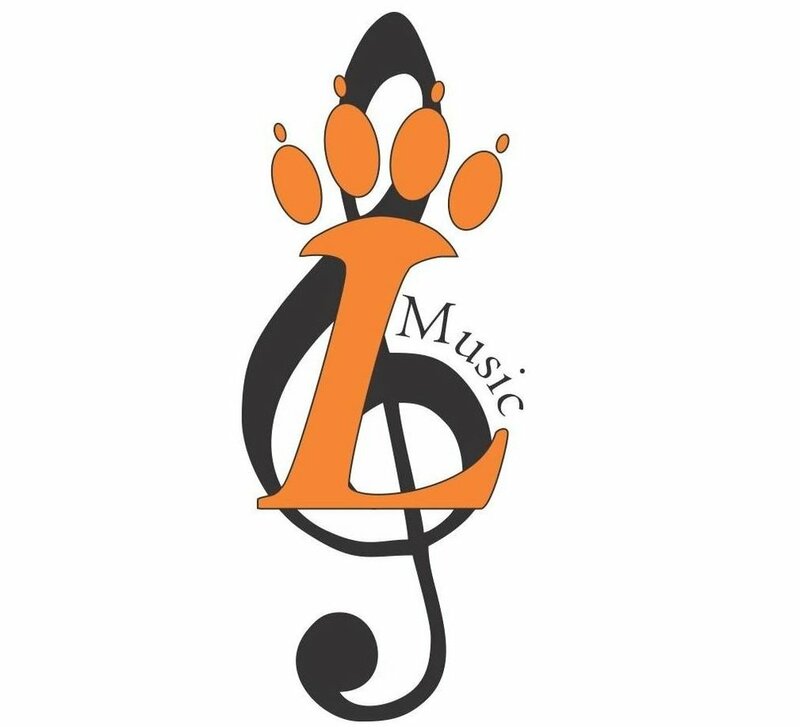 Make checks payable to Loveland Music Boosters. March 4th thru March 10th. All week Skip's will donate 25% of our purchases to Loveland Show Choirs. You must show a printout of some type for the credit, NOT digital. 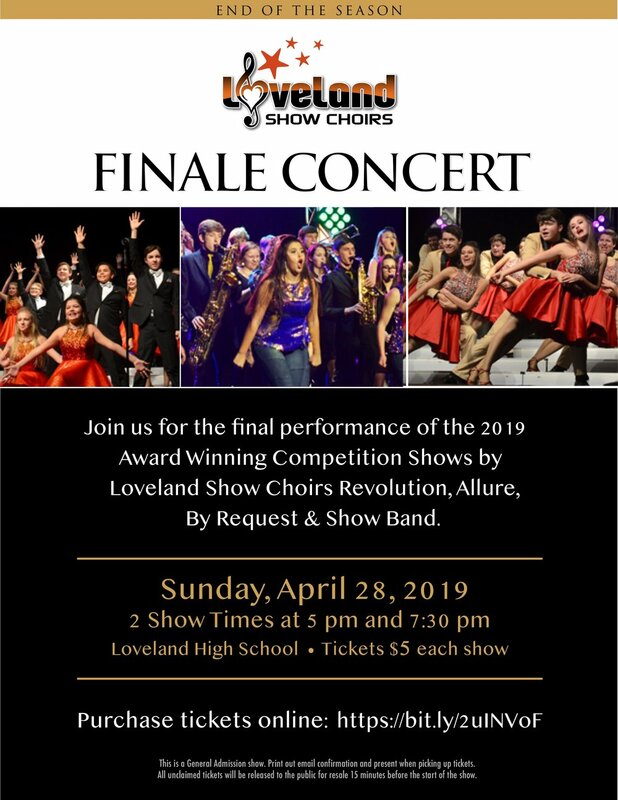 Can’t make it to the 2019 Loveland Show Choirs Showfest in person? Join us live! Midwest BEST BBQ will generously donate 20% of all purchases made from our supporters on these dates. You MUST present a flyer for Loveland Show Choirs to receive credit. You can bring a printed or digital copy. Show it on your phone! Including those posted on Facebook or Instagram. Loveland Show Choirs' next dining out event is with Biggby Coffee in Loveland, from January 21st- 24th, 2019. Biggby's Coffee will generously donate 25% of all purchases made from our supporters on these dates. 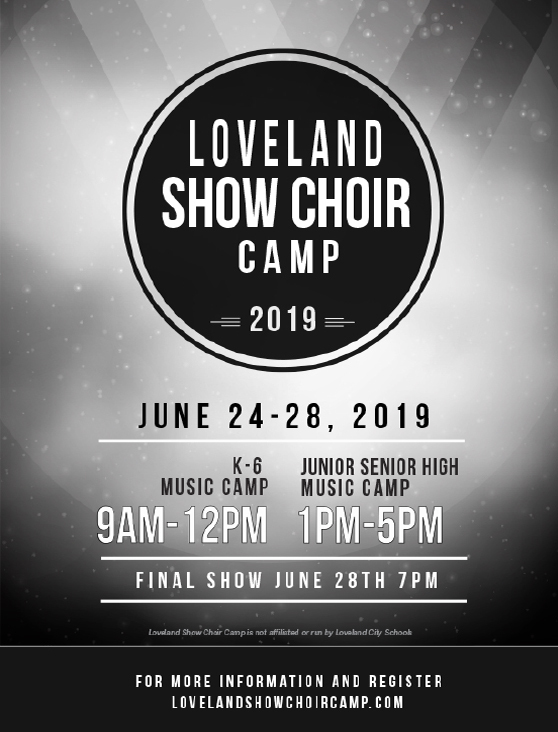 Tickets are NOW ON Sale for the 2019 Loveland Show Choirs Preview Night performance. SPIRIT OF THE SEASON: A Holiday Celebration. Join all three show choir groups: By Request, Allure and Revolution along with special guests on Saturday, December 8th at 5pm and/or 7:30pm for Festive Music and our annual Holiday Bake Sale. Loveland Show Choirs Spiritwear for the 2018-19 competition season is now available. Raising Cane's spirit night gives Loveland Show Choirs 15% of all purchases made from our supporters between 11AM and 9PM. Thanks to all who attended below is the link if you need to reference any of the information.